The New York Times, BusinessWeek, and Wall Street Journal Bestseller that redefined what it means to be a leader. Since it was first published almost a decade ago, Seth Godin's visionary book has helped tens of thousands of leaders turn a scattering of followers into a loyal tribe. If you need to rally fellow employees, customers, investors, believers, hobbyists, or readers around an idea, this book will demystify the process. It's human nature to seek out tribes, be they religious, ethnic, economic, political, or even musical (think of the Deadheads). Now the Internet has eliminated the barriers of geography, cost, and time. Social media gives anyone who wants to make a difference the tools to do so. 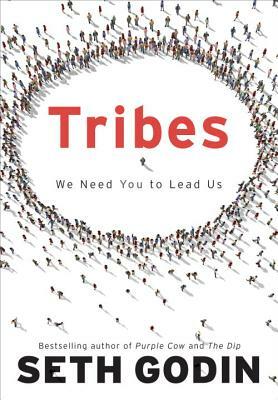 With his signature wit and storytelling flair, Godin presents the three steps to building a tribe: the desire to change things, the ability to connect a tribe, and the willingness to lead. If you think leadership is for other people, think again—leaders come in surprising packages. Consider Joel Spolsky and his international tribe of scary-smart software engineers. Or Gary Vaynerhuck, a wine expert with a devoted following of enthusiasts. Chris Sharma led a tribe of rock climbers up impossible cliff faces, while Mich Mathews, a VP at Microsoft, ran her internal tribe of marketers from her cube in Seattle. Tribes will make you think—really think—about the opportunities to mobilize an audience that are already at your fingertips. It's not easy, but it's easier than you think. Seth Godin is the author of more than a dozen bestsellers that have changed the way people think about marketing, leadership, and change, including Permission Marketing, Purple Cow, All Marketers Are Liars, Small is the New Big, The Dip, Tribes, Linchpin, and Poke the Box. He's an entrepreneur, the founder of several successful businesses, and a popular TED speaker. He writes one of the most influential business blogs in the world at sethgodin.com. "Tribes is a short book—only 147 pages. But its short size belies its true importance. As I read it, I was literally underlining every other sentence. I went through two hi-lighters before I finished!" "Godin...is uniquely respected for his understanding of the Internet, and his essays and opinions are widely read and quoted on and off." "It's easy to see why people pay to hear what he has to say." "If Seth Godin didn't exist we'd need to invent him." "If your idea, or issue, or candidate, or product isn't catching on, you haven't been reading Seth Godin." "Godin is endlessly curious, opinionated, and knowledgeable on a wide variety of subjects. He is a relentless marketer…and also a clear-eyed visionary."